With some 11m hectares of salt-affected lands, Ethiopia ranks first in Africa in terms of soil salinity caused by human activities and natural factors. This is a big problem for the second most populous country in the continent where agriculture accounts for 40 percent of the GDP, 80 percent of the total employment and 70 percent of the exports. According to Dr. Asad Qureshi, a senior scientist in irrigation and water management at ICBA and the lead author of the study, increasing soil salinization is a major cause of reduced natural biodiversity as well as low farm and livestock productivity in Ethiopia. 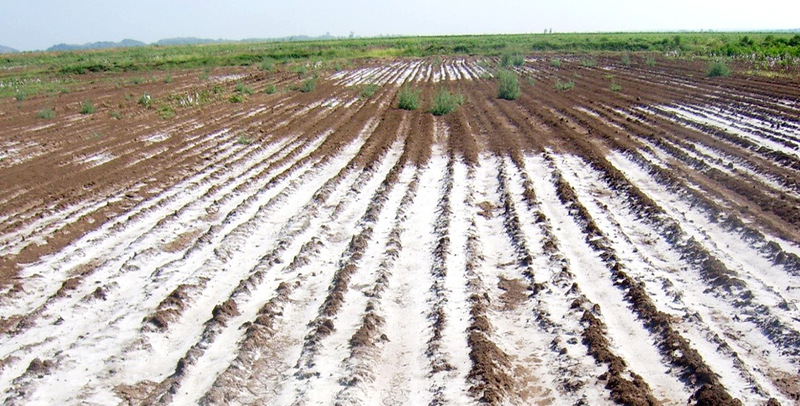 Not only can salt-tolerant food and forage crops increase agricultural productivity in salt-affected areas, but they can also help to rehabilitate salt-affected soils. This approach is best suited to regions where technical solutions to soil reclamation are expensive and time-consuming and growth of traditional field crops is restricted. Noting that there are varying causes for salinization including irrigation water shortage, deteriorating water quality, waterlogging, the study suggests different solutions to these problems. For example, in highly saline soil conditions, planting salt-tolerant forage grasses (i.e. Diplachne fusca, Chloris gayana, Brachiaria mutica, Cynodon dactylon) and leguminous crops is more practical. In areas where both waterlogging and soil salinity are present, cultivation of trees like Eucalyptus hybrid, Prosopis juliflora and Acacia nilotica for biodrainage can be useful. “Through proper identification of field crops and fodder species and varieties that can tolerate soil salinization and poor irrigation water quality, productivity of marginal lands can be maximized. In Ethiopia, this approach is of special importance because of the several reasons including high livestock numbers ― over 120m head of cattle, sheep, goats, camels, horses and donkeys. Fodder production for such a large population of livestock is a huge challenge. Therefore, there is a strong need for improved forage varieties that are resistant to biotic (pests and diseases) and abiotic (drought and salinity) stresses,” says Dr. Qureshi. Because of their diversity, halophytes have been tested as vegetable, forage and oilseed crops in agronomic field trials. For example, Salicornia (a multipurpose halophyte) yields around 2 tons per hectare of seed containing 28 percent of oil and 31 percent of protein. Quinoa, which has a high protein content and many essential amino acids, can also be successfully cultivated in saline conditions. It is also tolerant of drought, heat and frost. In an effort to combat soil salinity in the country, ICBA has been implementing for the past two years a major project called the Rehabilitation and Management of Salt-affected Soils to Improve Agricultural Productivity (RAMSAP). Funded by the International Fund for Agricultural Development (IFAD), the project is introducing to small-scale farmers salt-tolerant varieties of sorghum, pearl millet, cowpea, barley and sesbania. These crops have shown excellent results in different salt-affected areas. The project aims to help reclaim more than 100,000 hectares of salt-affected lands in Ethiopia.